I am writing this post on Saturday night (and I’m feelin alright… is that a song because it just popped into my head?). Anyways, I just finished my blog redesign, am SO happy with how it turned out, and am now quite excited to write my first blog post on this brand spanking new site. Also, I only recently found out that Lightroom CC is a thing and so I started using it today. PLUS I have no homework because this week was finals week. It’s a terrific triad that has left me feeling more pumped about blogging than I’ve been in a while. Today’s blog post will hopefully be the first of a series, which is why I’m giving it the honorable title of “number one”. What I Eat in a Day, a little food diary of sorts. An honest look at what goes into a real life human girl’s stomach in one day. The reason I hope to make this a series is because every day is sooo different. You’ll notice I ate pretty healthy that day. Cool. And then yesterday my period started and I cocooned in my bed after my last final, texting a friend for 1.5 hours, and eating milk chocolate with crispy flakes. Also cool. Self-care, amirite? Having multiple days on record will provide a more complete picture. And what I hope that picture shows is a balanced, healthy life. Why am I doing this? I like seeing what other people eat in a day. I think it’s interesting to see the kind of food that other people eat, especially when you’re like me and start having the same meals over and over and feel like you’re living in a box. Seeing the variety of meals out there opens your eyes a bit, and might give you some ideas for what you could make, or new snacks to buy and try out. DISCLAIMER: I do not make a judgment of this day of eating as “good” or “bad”. It is neither an example to follow, nor a… non-example. Only you and your doctors know what and how much you need to be eating. This is what ***I*** eat in a day. My breakfast was made for finals and for winter. A big bowl of oats that would warm me up AND fill me up. I made some beautiful turmeric oats, spiced with cinnamon, nutmeg, clove, all the good stuff. Cooked in almond milk with vanilla, raisins, and flax seeds (one of the superfoods I wrote about in my 9 superfoods post). Then topped with pecans, quark cheese, and chocolate (which just melts riiight in). If you haven’t tried “golden oats”, just go ahead and do it. 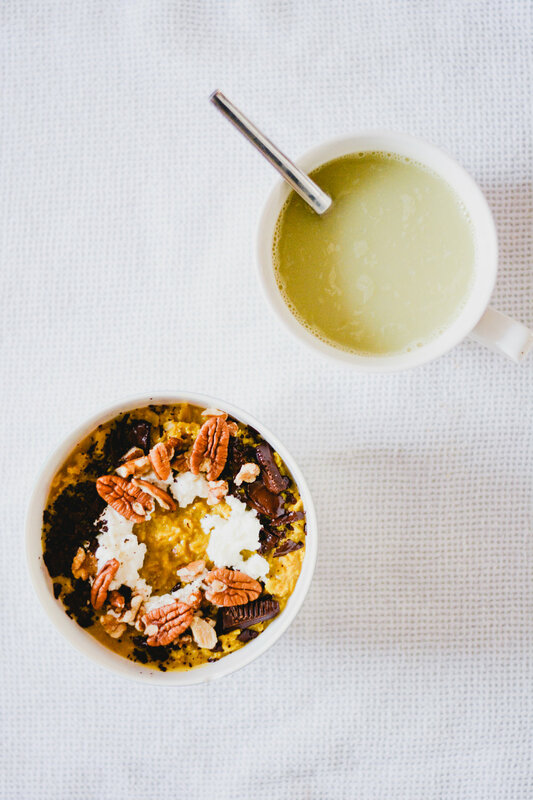 I’m not a fan of turmeric lattes but for some reason turmeric oats hit the spot. Paired it with a matcha latte because this girl needs to be alert for finals. Not that this girl wasn't well-slept, but you do everything you can when you've got an important test. Nothing better than an unexpected potluck, eh? I showed up to my second final and everyone was filling a table with food. I felt kinda bad because I didn’t bring anything. I’d been gone the week before so totally forgot and wasn’t there when they signed up, but I promise I’ll bring something next semester! I had a blueberry bagel with lotsa cream cheese, strawberries and blackberries (a rarity in the winter so of course I had to have some), carrots, grapes, and broccoli. Yum yum. When I got home I first went to the fridge to grab the rest of my turmeric oats, which I wasn’t able to finish in the morning (I’m sorry that this photo is so ugly. No amount of editing can mask the ugliness of half-eaten leftovers). Then I had a plate of leftovers: chicken, garlic green beans, sweet potatoes, quinoa, and of course half of an avocado. Ah, I get hungry just thinking about it. I finished the meal with chocolate, as per usual. My drug of choice is the 88% bar by Endangered Animals Chocolate. They are American-made, fair trade, and they donate 10% of their proceeds to the preservation of species around the world. How awesome is that? Do I dare to say even a little more awesome than eating chocolate? Yes, yes I do. I had volunteering that afternoon. I do this thing called Meals on Wheels where we deliver meals to seniors. I had a Dharma Bar before I left because I was already craving a snack and it usually takes us about 1.5 hours to do the route. I chose the endurance bar, meant as a pre-workout but hey ¯\_(ツ)_/¯ Volunteering is a workout of the heart? You can quote me on that. The ingredients in these bars are kuh-razy, only 6 in this one. And it’s all organic, except the salt, but can salt be organic? Not sure. The texture reminds me of Larabars, which I love. I totally prefer the more grainy kind of bar over ones like Rx Bars which feel kinda gummy to me. I also like that the ingredients aren’t totally pulverized, so I can taste little pieces of almond and date. They tasted great, very chocolate-y, which for me, is always a plus. While in the car (I was the passenger seat navigator), I had a sliced apple. Didn’t take a photo but who needs a photo of an apple anyways? Dinner was baked salmon and a salad: spinach, arugula, olive oil, lemon juice, quinoa, toasted almonds, dried cranberries. I believe that is all, my dad made it, so I’m not entirely sure. And half of an avocado. That’s right, ANOTHA ONE. On the cruise there was no avocado, believe it or not, and I’m still making up for that lack of the most beautiful food in the world. Which of the above meals would you want to have? And what food could you not survive a week without?